The time for Local and Mobile search is FINALLY here. I know we’ve heard that every year, but look around next time you walk through an airport. Notice how many folks are using mobile phones for more than just calling mom? These handy devices have worked their way into our daily business routines and this trend is only going to grow. If you want to learn the ins and out of Local and Mobile search join me and others at the SMX Local & Mobile show in Denver, Oct. 1 & 2, 2007. I would love to talk with any of you at the show. In fact one of the benefits of these smaller vertical shows is you do get more time and opportunity to speak directly with the experts. I’ll be speaking on the Tracking Clicks and Calls to Conversion session, specifically I’ll be talking about ways to capture offline sales. Many companies such as ones with complicated buying processes prefer to steer potential customers to a phone number rather than an online form. Often for these type companies the power of the voice is better than having the customer struggle through a series of online questions. In my session I’ll be discussing methods to capture these offline sales that are congruent with the company’s budget and tech resources. Offline conversions used to be the missing puzzle piece, but now there are a variety of methods to capture this data. I’ll be joined on the panel with Cid Jenkins form eStara, Michael Murray from AOL, and Cam Balzer from DoubleClickPerformics. Knowing these guys and their high level of expertise, I can tell you this should be a very informative panel. the Search Engine Land editorial team, Search Marketing Expo (SMX) Local & Mobile covers the latest tips and techniques for local search. It’s the only event 100 percent focused on the significant opportunity that the local and mobile space offers to search marketers. Check out the Networking page. I have some exciting news. Two people who I greatly admire are joining Jim, Mike, and the rest of the KeyRelevance team. The soft spoken and intellectual Bill Slawski and the energetic Li Evans are now on board and I’m extremely happy about it. Bill and Li are established search experts and are well known in the community. They are positively brilliant on search marketing and they are also a blast to work with. I’ve also know each of them for a long time. Years ago when I was on the SEMPO Board of Directors, I frequently used Bill as a sounding board. My position on the Board was to represent smaller SEMs and I would bounce ideas off Bill and always know we were mentally in-sync. I first met Li a few years ago through the High Rankings Forum where I am a moderator. Li was an active contributor and always impressed me with her original creative responses to discussions. Okay, enough rambling. Here’s a little background on Li and Bill. Liana (Li) Evans is well known in the search industry for her energy and creativity. Li specializes in social media marketing, blog optimization, link building and viral marketing. She has a background in both Public Relations and information technology and is a regular speaker at industry conferences including Search Engine Strategies and WebmasterWorld’s PubCon. Li also is the creator and main contributor to Search Marketing Gurus and writes for Search Engine Guide and InformIT. William (Bill) Slawski is a much respected SEO who was one of the founders and administrators for the Cre8asite Forums with my dear friend Kim Krause Berg. Bill is also a featured columnist at Search Engine Land on search related patents and research and writes a monthly column on small business issues. Bill speaks regularly on search engine algorithms and search engine optimization at industry conferences such as Search Engine Strategies and Webmaster World’s PubCon. Bill has the gift of taking complex issues and explaining them in layman’s terms and is also the creative force behind the popular blog SEO By The Sea. It can’t be the MIDDLE of July….my body is still in June. June felt like one long road trip. I had three conferences in a four week period. All were absolutely fantastic and I wouldn’t have wanted to miss any of them, but I wished I could have stretched out the time between conferences. The first week of June was Danny Sullivan’s new conference SMX Advanced in Seattle where I spoke on the Better Ways panel with Alex Bennert (Alex is a class act and I hope to be on another panel with her soon), Greg Boser (who never fails to make me smile with his quick quips), Jim Boykin (whose company WeBuildPages should rightfully be called We Build Links), Todd Friesen (Todd claims to have come over to the white hat side, but he’s not fooling anyone – we love him either way), Cameron Olthuis (Mr Social Search Extraordinaire), and Aaron Wall (SEObook himself). You can see Danny trying to keep this motley panel in check in the picture below. There have been numerous articles covering it and the rest of the show, so I won’t cover the content of panels here. To me, the conference was a networker’s dream – the small size and relaxed feel made it a fabulous place to informally develop business relationships. With the web becoming more socially oriented, having a network of friends and business acquaintances to call on is growing in importance. That may not be the case for all, but I’m finding I’m working with more of my peers than ever before. I’ve included a few pictures below just for fun. 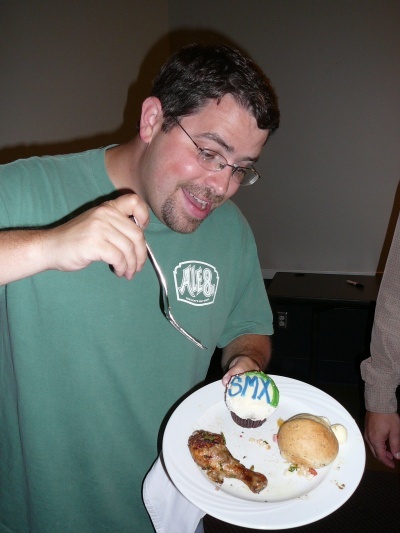 This is my all time favorite picture of Matt Cutts. It really shows his fun side and why he is loved by SEOs. Did I mention the food at SMX was fantastic? It reminded me of food at SES in the early days when we still had hot meals. Here’s a picture after lunch – notice no box lunches! 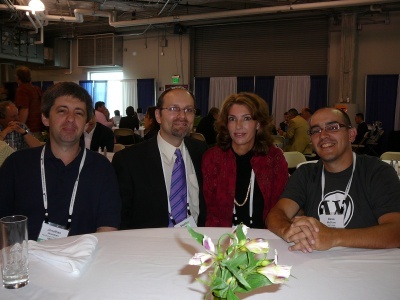 From the left are Jonathan Hochman, Stephan Spencer, Christine Churchill and Dave McClure. 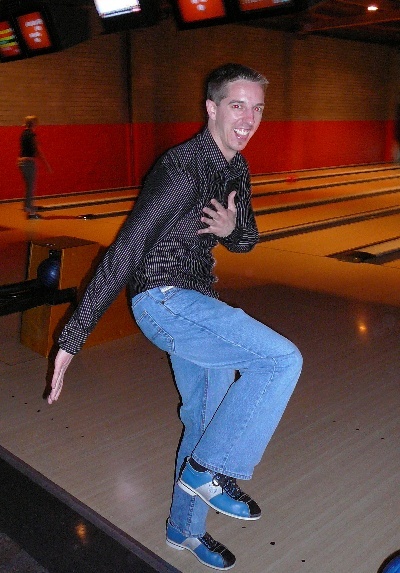 Todd Malicoat after “yet another strike” during the bowling match at the SEOMOZ party. The second week in June was SES Toronto hosted by Andrew Goodman and Chris Sherman. Andrew did a super job of planning out a phenomenal conference. He came up with some new sessions and elegantly mixed new with seasoned speakers to give the Conference a fresh feel. Andrew, pat yourself on the back because you pulled off a great conference! I also have to congratulate Incisive for moving the conference to June – the weather then was perfectly delightful. The only downside was I somehow managed to miss my friend Toronto native Brendan Kerin which bummed me out because I wanted to drop a baby gift by to his lovely wife. Sorry Brendan. My third conference of the month was in Denver, one of my favorite cities in the world. I have fond memories of Colorado from my college days when I attended Colorado State University and from visiting my parents who lived in Estes Park, Colorado. The Denver conference was the High Rankings Seminar which I always enjoy because it’s an excuse to combine work with friendship. Jill Whalen, Scottie Claiborne, Karon Thackston, Jennifer Laycock, myself, and my charming husband Mike Churchill gave presentations on a variety of search related topics. The weekend after the conference I played hostess to my friends and gave them a tour of some of my favorite Colorado places – Boulder, Estes Park, Rocky Mountain National Park, Trail Ridge Road over the Continental Divide and then through parts of ski country. It was a thoroughly enjoyable trip and it was great to be able to share places I love with people I care about. 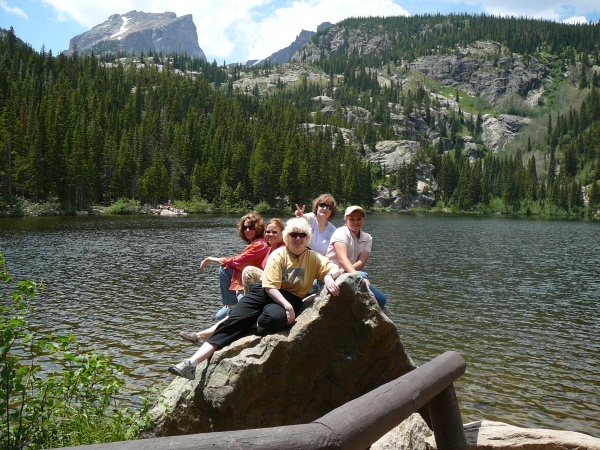 The gorgeous picture below was taken at Bear Lake in Rocky Mountain National Park. 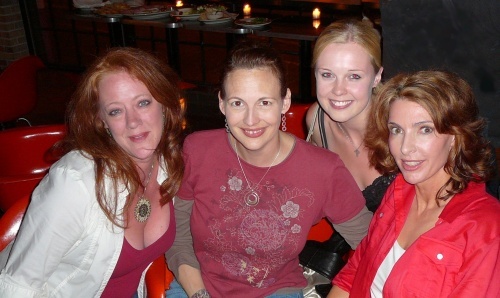 In the picture from left to right are Christine Churchill, Scottie Claiborne, Lee Laughlin, Kaitlin, and Jill Whalen (in the back – yes, the one putting rabbit ears on Lee). Pig Asking Pig How to Eat? Yahoo…. Rumor has it that new Yahoo executives are running around the trough asking other Yahooers about the direction of the company and what needs to be done. Ain’t that a laugh! From my experience with the Yahooers I’m allowed to interact with they are part of the problem — not part of the solution. Many recommendations have been forwarded to Yahoo (from little ole me) regarding their PPC systems and to date NOT ONE has ever been implemented. But then, what do I know since I’ve only used PPC systems for years to manage many, many client accounts? A couple of these recommendations were almost guaranteed to put lots of $$$$ in Yahoo’s pockets. So Yahoo… this is an open challenge to see if your new executives are serious about making improvements and money! Talk to the “right” people — yes, I’m one of them and not that hard to find. You might even want to keep in mind that at least one high level executive on “Wall Street” values my opinion. That’s kind of funny… Wall Street wants my opinions on Yahoo, but Yahoo doesn’t. According to the Press Release (PDF) issued on Tuesday, 10 July, 2007, Nielsen//NetRatings is going to begin using “Total Minutes” as the “best engagement metric” for Web 2.0 sites. Since sites using Flash, AJAX, streaming media, and other rich internet applications (RIA) tend to have relatively few page views for a given length of visitor stay, this will have a net-negative effect on large traditional sites that do not have that RIA interface. For example, a typical visitor on Google spends 20 seconds per page, whereas a YouTube visitor spends more than twice as long per page on a typical visit (46 seconds).